2 Million+ people worldwide use Hydro Coach as their water reminder app every day. 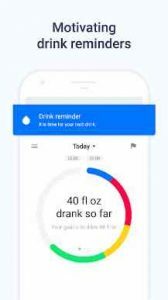 It’s a free water tracker that reminds you to drink water and even syncs your water intake with Fitbit, Samsung Health and Google Fit. Define a custom target or calculate a personalized one by entering age, weight, lifestyle and weather. As a PRO user you can even automatically adopt it with automatic weather forecasts. Are you pregnant or breastfeeding? No worries, our free water tracker app will take it in consideration. Create a healthy habit with Hydro Coach by getting notified to drink water on a regular basis. We give our best to make it as easy as possible for you to stay motivated and reach your goal. Start with free to use predefined volumes or choose from many different vessel types. Every drink is highly customizable. Name it, color it and size it your way. Try it out and create your first fancy blueberry-banana-vanilla-smoothie or a simple 250 ml orange juice. FYI: Hydro Coach is the only water reminder that is designed to work with Fitbit activity trackers and Fitbit smart scales. Get detailed insights with a helpful dashboard. Check out your most used drinks, a day of week ranking and much more other useful data that helps you to drink water and find success in your water drinking challenge. Do you drink water regularly? Do you use a water reminder and water tracker app? This app is quick and easy to use! I have such a busy schedule so i always forget to drink water but this helps in reminding me to stay hydrated. I get migraines if I don’t drink enough so this app is a lifesaver on busy days. Love the reminders throughout my hectic days. Just wish you could put specific ounces such as 16.9 oz, which is the size bottle I usually have. It’s nice to have something that never failed to remind me to keep healthy. This Application is a perfect self motivating tool and excellent to use. Hi, are you still top hydrated? We have just released an even more motivating Hydro Coach. Enjoy and also share the mission with your friends! Simple with Samsung Health integration. Love it! I do like this hydro app!! It is nice to track how much I’m drinking!! But the notices are extremely quiet or dont ring at all!! So it’s easy to go past the times you wanted to drink!! But I still did better with this than I do without !! I really like this app! It helps me keep track of my water intake and reminds me to drink! Its perfect for helping me track my water intake on a daily basis. Hi Tygur-Alena. Oh I’m really sorry to hear. But when you swipe down in the diary or touch your target there you are able to change your target. You can change all data needed to calculate your target by clicking the dots right to the amount. I really hope this helps you out. NEW: Thank you for your update!